For the past three years I’ve been intrigued by ice climbing. Maybe because it was such a foreign thing to a girl from Florida or maybe because swinging ice axes just looked like a lot of fun. Either way, in the back of my mind I decided down the road I better try it. Fast forward to this past year. 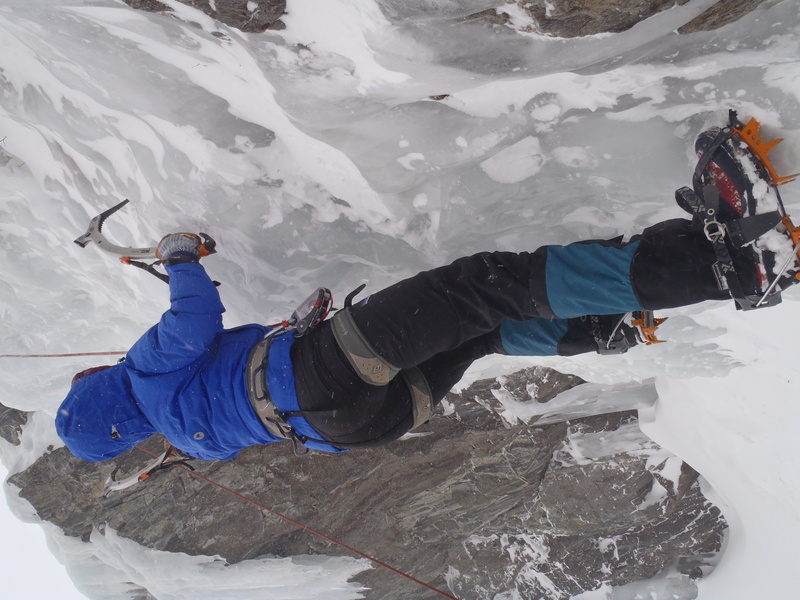 Hearing such great things about ice climbing through my social media network, I decided to set it as my #wintergoal of 2011-12. Andrew, who hasn’t climbed on ice either promised he’d figure out a way to take me for my birthday. Luckily our good friend PJ and his wife Katrina offered to go with us. 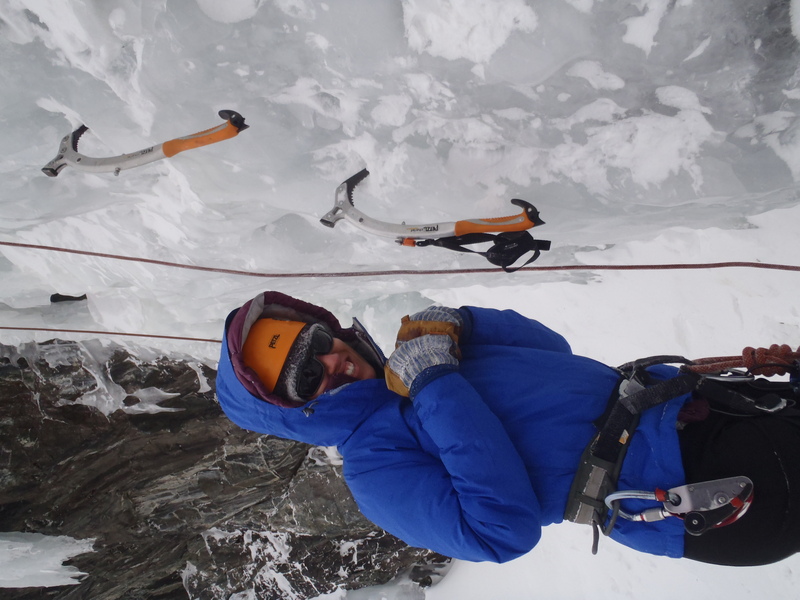 PJ has plenty of experience ice climbing and suggested Hoosier Pass. Compared to RMNP, Hoosier has a pretty easy approach and the weather channel ONLY predicted 50 mph wind gusts compared to the 80 in RMNP. We left Golden around 6 am and drove through a snow storm on I-70 until about Frisco, where skies turned clear. The weather looked promising. Promising, until we got to Hoosier Pass where the wind was blowing gusts of at least 50 mph. (Up until that moment I had convinced myself the weather guy was going to be wrong.) We laughed about how ridiculous the weather was, sat in the car a little longer than usual and then threw on everything we owned and started up the trail. The trees blocked the wind on the way up fairly well, but as soon as we got to the ice we could feel the wind again. Andrew and PJ went off to set up a top-rope while Katrina and I stood behind whatever we could find to block the wind. Two parties of guys where up there besides us and both couldn’t figure out why or how someone had convinced us to climb on a day like that. Obviously expecting us to say “our boyfriends dragged us up here,” Katrina was quick to blame me instead, and I took a little pleasure in it. After top-rope was set-up, I tied in and practiced climbing on a very low angle ice slab (with one axe) up to the start of the climb. Katrina was too cold to climb and I wasn’t able to keep my hands and feet warm, so we figured we’d climb one pitch and head home. I climbed first, and PJ instructed me how to hit the ice and how to kick my toes in and then put my heels down. With the wind and weather like it was, there wasn’t time to really get into details on technique. Later, while looking at photos from the climb, I could see that my rock climbing technique tried to come out in my foot work on the ice. At the end of the climb I got to experience the absolute worst case of “screaming barfies” I’d ever had. Between wanting to cry and scream and jumping up and down, I was still excited! Cold as I was, it was the perfect birthday and the perfect way to end the year! We ended the day with good friends and a new Thai Restaurant in Golden. The food was amazing, and it brought me back to daydreaming about warm climbing on the beach in Thailand (only a few weeks away). 1) Bring goggles. Between the wind and ice that comes off when you’re hitting your axe in, they can be useful to have. 3) Bring hand warmers that actually work. We bought some cheap ones last-minute and they weren’t warm at all. 4) Bring extra gloves and mittens! I did this, mainly because I had lost just ONE of my nice gloves the day before and I wasn’t sure which pair I wanted. I was glad to have a few. 5) Down is the best thing in the world…. but we all knew that already didn’t we?! Oh you brave silly girl…. congrats on accomplishing this goal!! Happy New Year Whitney! Handwarmer’s are definitely a must! When it’s really cold I also bring a huge down puffy to wear over my hardshell while belaying. Some ppl like softshells but I prefer to climb in my hardshell with a lighter down sweater underneath. Thanks! The big puffy down is a definite plus! I had down on under my shell but I threw on someone else’s large puffy while I was waiting and it was wonderful! My biggest issue was that none of the gloves, or liners and mittens kept my hands warm enough. Pingback: Chicks Climbing » Blog Archive » Happy New Year from Chicks! Thanks for the comment Christine! It was a ton of fun! I think the hardest part is knowing what will work best for you as far as staying warm enough goes.